2019 Weebly Review: How Good Is Weebly Really? Read our experience using Weebly to build a small-business website. We went through Weebly’s templates, tools, and e-commerce features. We did a quick browse of the app store to get a complete picture of what our business could be like as a Weebly website. And we all know that guy who’s different with his friends than he is in private, so we did a little digging into the Weebly business plans—just to see how different they really are from the free version that everyone else gets to see. Long story short, the experience varies a lot depending on your business, the templates you use, the plugins you get, and the plan you sign up for. So Weebly definitely isn’t for everyone. But if you’re a low-maintenance kind of girl site (like a restaurant that just needs a place to list their address and current menu), if you can put up with a few glitchy bugs, and if you’re willing to put in the time to get that Weebly website builder working for you, then the platform can offer a lot of perks. Wondering if you can hang with Weebly? Read on for our full Weebly review. Weebly is primarily a website building and website management tool, though the service does include web hosting as well. In plain English, it’s a way to build a website for your business, then keep it up to date as your business grows. Here’s the thing about the Weebly website builder: it offers a lot of features and tools, but it hides a lot of them behind a paywall. What does that mean for e-commerce sites? Well, it means you can get all the same e-commerce options and tools that you’d get on other website builders, but you have to sign up for the Pro Plan or higher to get them. So if you’re tempted to use this platform because you heard you could build an e-commerce site on Weebly for free (or for less than other builders), we’re going to recommend that you go ahead and move along to Wix or Squarespace. But if your business tends to rely more on in-person sales, we think you’ll be pretty happy with Weebly. Weebly is a drag-and-drop website builder, so it’s pretty easy to build a nice-looking site with minimal effort. And guess what? The pretty web design is included with the free version of Weebly’s website builder, so you don’t have to pay extra (unless you want to). That makes Weebly one of the more cost-efficient platforms for brick-and-mortar stores, which don’t usually need more than a menu or a slick about page. 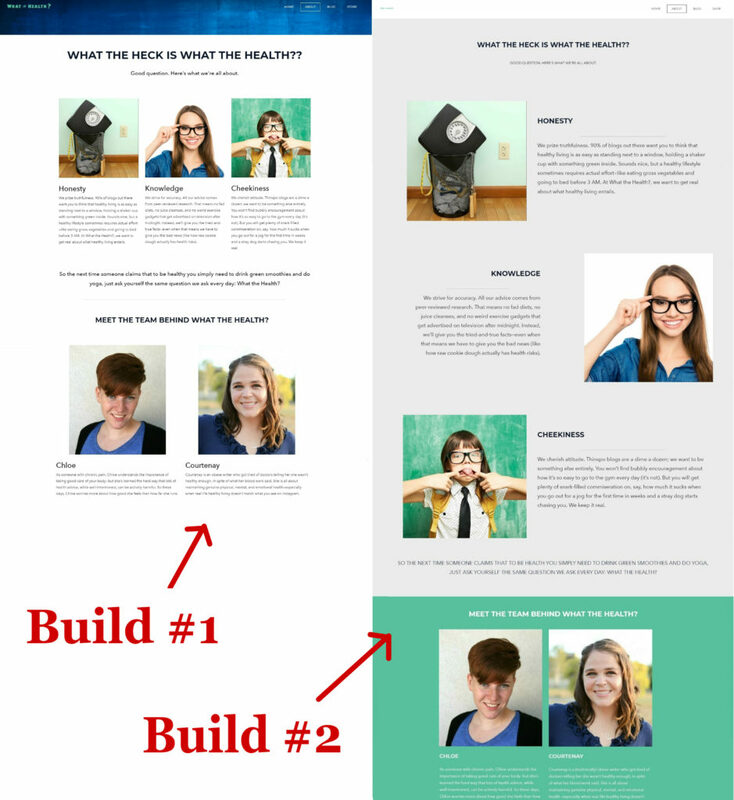 So how does the Weebly website builder compare to other best website builders on the market? Let’s jump in. The Weebly platform was pretty easy to use. Like many platforms, Weebly is a drag-and-drop website builder, which means you can literally drag and drop pre-built content blocks onto your page. These content blocks range from simple images and text boxes to complex galleries and overlays—overall, pretty standard fare for this type of builder. The main thing we liked about using the Weebly site builder was how easy it was to see your options. The dashboard showed exactly which content blocks were available on each page, so we could pick and choose the right elements for our site without having to do a lot of work. The dashboard was also consistent across the platform, so we were working with the same tools on our home page as we were on our store page. That made our whole Weebly website faster and a lot easier to build than it was on other website builders (cough, Shopify, cough). In the end, though, we stopped short of giving Weebly’s platform a five for usability because while the platform was easy to use, the drag-and-drop editor was a bit quirky at times. We struggled trying to expand the width on a column. We uploaded two images side by side and one wound up slightly longer than the other—even though they were the same size (we double-checked). And we occasionally scrolled past sections we’d already completed only to find that something had glitched and our design was now all messed up. Those problems were pretty easy to work around. But we’d have preferred not dealing with them in the first place. As we’ve already mentioned, professional web design is one of the things you get with Weebly for free—no plan upgrades required. You can also use the mobile preview feature to make sure your site will look right on mobile devices. Pretty much all Weebly templates look good with a minimal amount of work. Of course, we didn’t think our Weebly website looked quite as striking as our Squarespace website, but it was close enough that most people wouldn’t really notice the difference. But the blog . . . the blog was bad enough that it single-handedly brought Weebly’s Design score down to a three out of five. Without any Weebly apps to clean it up, the blog looked like it was a relic from the early 2000s. And unlike other elements of our Weebly website, the blog was not improved (or impacted at all) by switching templates. However, we want to note that we didn’t try any of the not-free templates. So it’s totally possible that the blog would look better if you fork over an extra $50 or so for a premium template. But if your business is operating on a shoestring budget and you absolutely need a professional-looking blog, you may be happier with Squarespace or Wix. Basically, if your business primarily makes money off your written content, Weebly probably isn’t for you. The Weebly site builder was a bit of a mixed bag when it came to customization. On the one hand, Weebly offered something that Squarespace and Shopify didn’t: the ability to customize everything in one place. So if we wanted to change the background color on a section, we simply clicked the section and selected “Change background”—no navigating to separate tabs, backtracking through submenus, or trying to figure out which setting corresponded with each part of the site. So the ease of customization was there, but as we mentioned in our “Usability” section, customizing our Weebly website got a bit tricky. Specifically, the platform would randomly glitch and mess with our borders, images, and text boxes, so we felt like we were backtracking and fixing spontaneous problems more often than we wanted to. On the whole, though, the platform had all the right tools in all the right places, which made it pretty easy to build precisely the website we wanted—even with the occasional bumps in the road. We should also specify that we did our entire build without making use of the Weebly app store. The app store is chock full of extra tools for e-commerce sites, blogs, and more. We could have literally spent hours customizing our site with all the apps and social media integrations available there. But we figured most small-business owners wouldn’t have the time to do all that in one session, so we skipped the app store this time around. Whether running an online store, a brick-and-mortar business, or a content-centric site, Weebly users can take advantage of a number of features and tools available on the platform. But more often than not, you need to upgrade your plan above the Weebly free version to get the full range of available options. So how much does it actually cost to run a Weebly website? Here’s how it all breaks down. Many online reviews mention Weebly’s Starter plan. But the platform recently discontinued its Starter plan, so your options are limited to the plans we’ve outlined here. Bummer. As you can see, plans start at $8 per month—considerably lower than most other website builders. But for more advanced plans, you could pay as much as $46 per month. All of that is before you factor in the cost of your template (a one-time fee), transaction fees, and apps. While Weebly’s app store features a number of free apps, there were also a good number that required paid subscriptions. One app even cost a whopping $150 per month! So make sure to take those extra fees into consideration when planning your monthly budget. Now we also want to address the elephant in the room. You may have noticed that we didn’t include the free Weebly plan on our table. That’s because it basically amounts to nothing more than a Weebly free trial. It doesn’t include a unique domain name, it features an ad for Weebly, and it doesn’t include most of the features that a business needs to actually run a successful website. We’ve said it before, and we’ll say it again: if you’re attracted to Weebly because you heard it’s free, you are in for some pretty severe disappointments. Of course, that doesn’t mean Weebly doesn’t offer any ways to save. If you opt to sign up for an annual plan (instead of going month to month), you do get a discount on your service. From there, the actual cost of your Weebly plan will depend a lot on the type of site you’re building and the features you want. Unfortunately, many business owners are initially attracted to Weebly because of its low starting price ($8 per month for the Connect plan). But as you can see, those low-cost plans are pretty sparse in terms of features. The Connect plan, for instance, is really only good for brick-and-mortar businesses that need a minimal online presence (we’re talking just a page or two). If your business makes money off your blog, you’ll definitely want Weebly Pro (or higher). With the Pro plan, you can register your own domain via Weebly, take advantage of unlimited storage, and enjoy more visual elements like video backgrounds. Plus, you get more Google analytics to help you track your site’s performance. But if you’re an e-commerce business, you simply won’t be able to get by with less than a Weebly Business plan. With the Business plan, your customers can actually check out on your domain, which makes you look a lot more legit than pushing them to the Weebly checkout site once they’re ready to buy. You also get the ability to offer coupons, manage your inventory, and even fulfill orders for digital goods (like e-books). And then finally, there’s the Performance plan. This plan has basically everything you could need to run your online store, including integrated email marketing that lets you keep your loyal customers and members up to date with new content, products, and more. In the end, business owners who want to set up a full-fledged online store will probably pay more with Weebly than they would with a comparable website builder like Squarespace or Wix. But if you don’t need every single bell and whistle, Weebly can be a real money-saver. Want to send mass emails to your subscribers but don’t want to sign up for a higher-tier plan? Weebly also offers Weebly Promote—a supplementary email marketing plan you can add onto your existing Weebly account. The more you know, right? In addition to the sheer cost of your service, there are a few other things that can drive up the cost of your Weebly plan. For starters, you may have to pay a one-time fee for your templates. As far as we could tell, the most you’d ever pay for a Weebly template is $49. But we also only looked at the templates directly available through Weebly. You may have to pay more for a template if you go through a third-party developer. You may also have to pay extra for your apps. The Weebly app store features hundreds of apps, so we weren’t able to scope out all of them. But from what we could tell, many of the apps were free, a few were ludicrously expensive (like $150 per month expensive), and most were mid-ranged—around $10–$20 per month or so. Finally, you may have to pay for your domain as well. Like many domain registrars, Weebly does throw in the first year of your domain registration for free when you sign up for an annual plan. But after that, simply keeping your domain name can cost you upward of $18 per year. 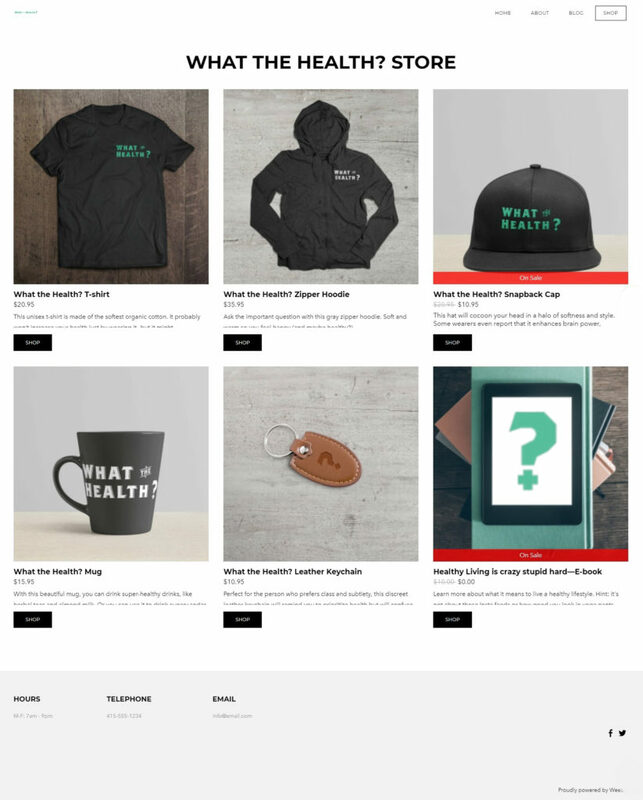 Starting up an online store? Even if you’re only selling online, you’re going to need a business license and employer identification number (EIN). Unfortunately, business licenses aren’t free, so be sure to budget in that expense as well! Sure, Weebly’s app store is comprehensive, the platform’s dashboard is easy to use, and Weebly websites are beautifully designed. But underneath all that, Weebly also packs a pretty hefty punch in terms of optimization tools and support. Weebly is pretty darn good when it comes to search engine optimization (SEO). Search engine optimization is basically how you make your website stand out to search engines. If search engines can tell your website is helpful for your prospective customers, those search engines then float your site to the top of search results for topics related to your business. That means more people see your site, which (hopefully) means you get more customers. Some website builders make this process easy for you. Weebly, for instance, lets you customize your URLs (the addresses where people find your pages) and your meta descriptions (the short blurbs that people see under your page names in search results). Weebly also offers fairly good site speeds, so customers don’t have to wait forever for your site to load. That also helps your site top the search engine results. And of course, if you have the Weebly Pro plan or higher, you can track your site’s performance via integrated Google analytics. Weebly helps your site top the search engine results. One big downside to Weebly, though, is the fact that the platform doesn’t include SSL encryption unless you get the Business plan or higher. You may have clicked on a site and seen an error message like this: “Warning! Not protected!” That’s because that site didn’t have SSL encryption to protect customers’ online data. Having no SSL encryption is a big no-no if you want search engines to like your site. So by not offering that oh-so-vital SSL encryption with every package, Weebly’s essentially strong-arming its users into signing up for a higher-tier plan. Not cool, Weebly. Straight talk: Weebly has a pretty bad reputation online right now. As of this writing, Weebly has a Trustpilot rating of just one star out of five.1 But reading over the reviews, it seems that the biggest complaint across the board is that the platform recently blocked all traffic in Russia and Ukraine over security issues. The vast majority of negative reviews for Weebly seem to come from Russian and Ukrainian users who are furious that they can no longer access their sites. We think that’s a fair criticism—we’d certainly be mad if one day we could no longer log into our site just because of our physical location. But we’ve also got to admire a platform that is clearly committed to the online security of its users. If you’re still not sure if Weebly is right for you and would like to see what a basic build looks like, we’ve documented our experience. Take a peek below to see what it was like to put basic website pages, a blog, and an e-commerce shop together. So in doing our research on the Weebly platform, we actually wound up making two different sites for the same (fictional) business. Unfortunately, we only recorded one, but we did snag pictures of both. 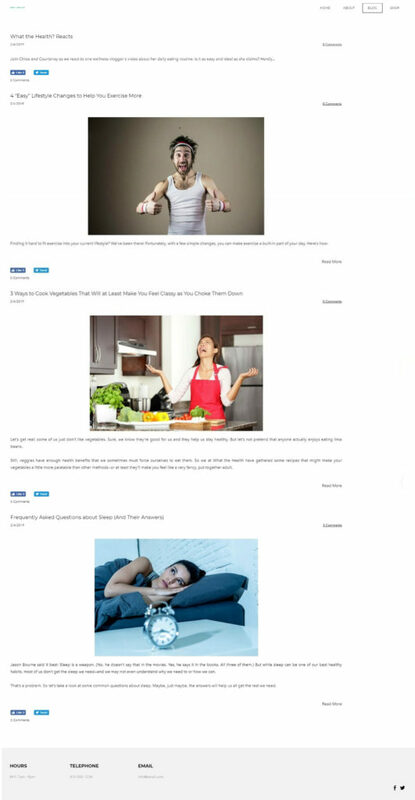 The main difference between these two sites was their templates. We learned through our testing that website building on Weebly can vary a lot depending on which template you choose. For instance, our first build came with a content block that allowed us to use a collage-style collection of images next to a text block. On our second build, we weren’t even able to put a single image next to our newsletter sign-up. Picking your template is the first step of setting up your site, and if our experience is any indication, you could wind up hitting your head against a wall halfway through your build if you select the wrong template for your needs. So no pressure or anything. The best advice we can give? Take your time checking out the sample websites for each template. If the example you’re being shown is for a restaurant and you run an e-commerce store, that may not be the best possible template for you. 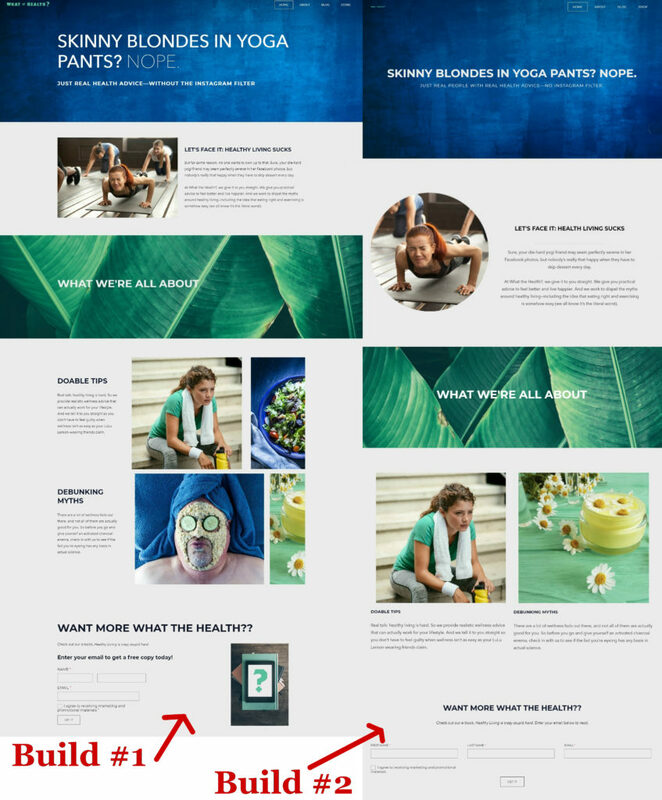 In the end, though, we wound up being pretty happy with both versions of our home and about pages. We didn’t think it was quite as posh as what we were able to build on Squarespace, but you can pretty much count on getting a professional-looking site with quality web design (even if you do happen to choose a less-than-ideal template). The blog was definitely Weebly’s bag of hair (Fever Pitch? Anyone?). We were really disappointed in the overall look of our blog on Weebly. Honestly, the end result gave us flashbacks to college, when we used sites like Blogspot and Xanga to share our poorly written (but oh-so-meaningful) poems and 18-year-old wisdom with the world. So yeah—not a great look for a website building platform trying to sell you on its professional web design. To be fair, just a quick browse of Weebly’s app store reveals that the platform offers tons of apps and tools to help you improve the overall look of your blog. But let’s be real: that means you have to spend extra time a) figuring out which features you want, b) finding the right apps to give you those features, and c) learning how to use each app so you can actually build the blog you have in mind. And depending on the apps you choose, it could wind up costing more every month. If you, as a small-business owner, have time for that, then more power to you. But for the rest of us mortals, that’s way more work than we have time or energy for—especially when you can easily get a professional-looking blog with a lot less work on another website builder. Once again, we found that the look of your online store can vary a lot depending on the template you choose. 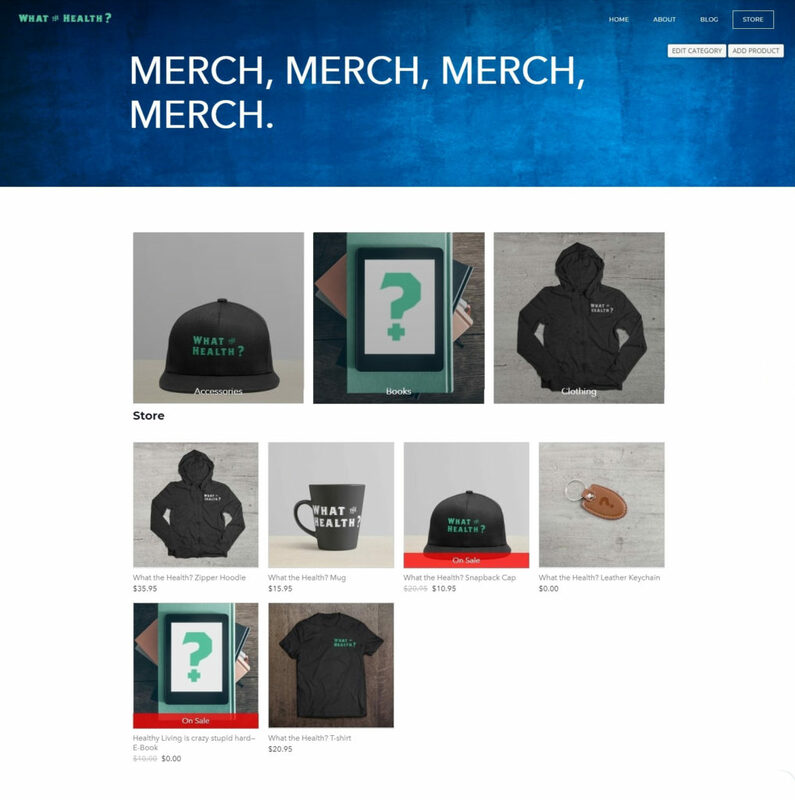 On our first build, the store seemed more or less the same as what we got with Squarespace, but with a little less customization. On our second build, though, we were surprised to find that simply adding our products didn’t auto-generate an online store. Instead, we had to use the Weebly dashboard to add content blocks—just like we did with our home and about pages. That meant, if we wanted to, we could’ve added videos, animated banners, featured products (sorted by category, of course), and heaven only knows what else. In the end, though, we went with something simple. The site we were building didn’t need a super fancy online store. And building out an e-commerce site to rival H&M’s online store would’ve taken a lot of time and work that we just didn’t have. But it’s possible, people. So if you’re out to build the next ModCloth or ThinkGeek, Weebly may just be the right builder for you—as long as you have the time. It’s hard to put a label on Weebly. It was both highly usable and glitchy. It had great web design but a horrible-looking blog (unless you supplemented your template with apps). It gives e-commerce users free reign to create a stunning store but skimps on vital features unless you pay extra to upgrade your plan. In the end, we think Weebly is a quality website builder. But to take advantage of everything it has to offer, you’ll need to devote a bit more to your budget and find the time to figure out what you want from your site—not to mention the best templates, apps, and tools—to make it happen. Since we don’t know many small-business owners who have oodles of extra time and money, we’d recommend sticking to a simpler website builder like Wix, Squarespace, or BigCommerce if you’re running an e-commerce store. But if you just need a simple (but beautiful) site to be the online face of your brick-and-mortar store, Weebly’s basic plans are sure to provide the cost-efficient building options you need.